Hey everyone its me again, i was bored and thought i could share this one, its pretty straight forwards and obvious build, but it could be usefull to some people, at least i hope. So yeah another physical WB, why add this one to the list ? well why not ?! Sheet DPS goes pretty high once more, even if we all know there is a difference between that DPS and the actual in game DPS, still its always satisfying to reach such numbers, and yeah its stupid. Those are with procs on obviously. Its physical build so, just max cadence, CoF, and breaking moral (i dont know why its 11/12 on grimtool btw, maybe cause of +skills of relic) and you have it. Since its physical build it aint gear dependent, but obviously warborn set and leviathan are the obvious choices, same for ring of the black matriarch. Depending of how you build you res, you can take Mark of Divinity as medal, but i didnt felt like it was needed. About ADCTH, if you dont have the medal and/or decent solael pants (then take chausses of barbaros) think about restless remains component, and also lifegiver ring is a good option if you dont have good cronley ring. 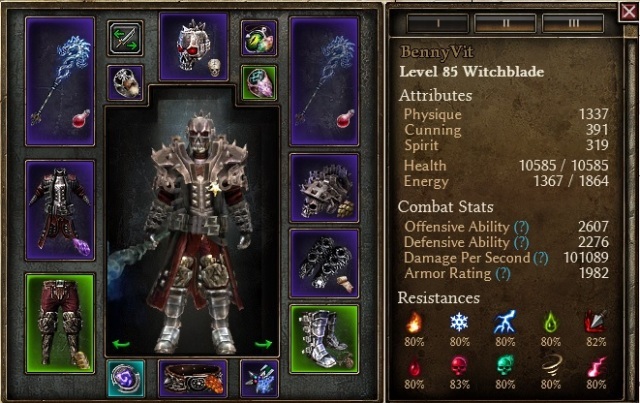 About JoVs setup (see it just a bit under), Badge of Mastery is indeed best choice, obviously loosing Black star of deceit will make res a bit more tricky to cap, especially for chaos, and Potent Essence of Chthon as weap augment will be even more needed; also switching to Grasp of Unchained Might gloves instead of Voidsteel Gauntlets will make you loose a bit more chaos res but its proc is more than welcomed giving us +10 attack speed and assuming you have one "of kings" item our attack speed will reach, under procs around 185% which is pretty pretty good for a 2h (remember Leviathan doesnt give us attack speed also); as JoV said an "ordered" affixe will be well needed to cap our res. This setup sureoffers more damage output especially will all procs on; still it will need you to get more specific MIs to cap res and get enough ACDTH; feel free to go for it if your gear allows you to. Personaly i kept Giant Blood devotion. yeah its a warder, you can also go for shaman but i prefered occultist for CoF, attack speed from solael witchfire and Blood of Dreeg with poison and physical res, and OA. Still with Shaman youll get more HP and mana wont be an issue, cause yeah its one of the cons. The deal is to grab both Kraken and Oleron. For those who aint familiar with this, to grab Kraken just complet a random constellation like Eel to unlock Kraken, once Kraken is unlocked and completed youll be able to reset the points in Eel. I took Owl cause of the -5% energy cost and 15% reflected dmg reduction, but you could totally take empty throne instead if you need it to cap your res or hammer. About attributes, put a very few in spirit to equip the needed gear, same for physique then rest in cunning to reach decent OA, feel free to adjust according to your needs and tastes. Again about Jovs set up, you can also go full physique even if it aint needed to get decent DA. As i already said, prepare some mana potions, but its manageable enough imo; also other main con is the lack of AOE dmg, CoF with falcon swoop sure help a lot, but be aware its not where this build shines. Breaking moral is only needed on bosses/heroes or bigger mobs like flesh hulks, you shouldnt need it against the rest. could do crazy numbers in crucible, i didnt tried but this build isnt made to be played in this mode anyway imo. Lots already been said about physical witchblade, so i wont say more about, still i felt i could add this one to the list since its 2h, its more than viable over whole campaign content, including nemesis; and again very flexible about the gearing and so can be "rookie" friendly. I hope it will be usefull to some and, as always feel free to comment, ask questions and give opinions ! Last edited by Thrasheur; 01-10-2018 at 09:19 PM. Was there supposed to be an augment on your weapon? Imho potent essence of Chthon would be better option. Nice build, I have similar one tho with a bit different gear and devotions. Noticeable difference is that my setup is using dire bear devotion on top of Kraken and Oleron and for additional ADCTH Im using Dreadloards Cronley signet instead of BSoD. To compensate lack of Behemoth I pumped extra points into menhirs will, left blitz on only 1 pt investment and used other points in soldiers passives/actives. Last edited by JoV; 06-19-2017 at 02:32 PM. 2H build is badass by default. Or is that a code for "nothing to nerf here"? 100k dps... I think my full ultos Warder was at 50k at best. I had the same idea earlier this year but completely lacked Warborn. It's not the same as jajaja's since jajaja's Warder uses Savagery instead. EDIT: wish Markovian was a viable set for 2H builds. Would be twice as badass cuz of looks alone. Last edited by Stupid Dragon; 06-19-2017 at 02:49 PM. Also "lame" cause its straight forwards build, nothing original or difficult to understand in it, and kinda hold LMB; and i love being ironical. With all those physicalk witchblade with warborn we had at some point, i just felt i could post a 2h for a change, that is again, really viable and "noob" friendly since its physique. Similar to AAR builds, 2H phys builds look really good on paper, but noting more, in any other aspect they are mediocre when comparing to DW or S&B. Im using ordered soleal sect of natures bounty as pant, ring is dreadlords of alacrity, boots are same as yours. P.S. It is full physique, but again basic value of 2.6k OA is mediocre and should be easy achievable. Setups has 3 procs that are significantly upping OA and that is pretty much redeeming in that aspect. Also I pumped OR to 16/12 to get some more OA and flat trauma, trauma DOTs are in range of 60-70k whit usage of Olerons Blood, with addition on blitz they could achieve more than 80k easy. Last edited by JoV; 06-19-2017 at 03:44 PM.